It was time to better document the tools available in SBPOP for modeling and simulation work in the pharmacometric area. The tools for systems biology, of course, have always been well documented. Along with the better documentation many improvements were introduced, requiring a reorganization of the code. The "SB", "SBPD", and "SBPOP" prefixes for the functions in the different packages did not make sense anymore after this reorganization. Thus a new name was sought, that by not using "SB" reflects that the complete package is not only focusing on Systems Biology, but that a much wider area can be covered. I will not make it long. The SBPOP Package / SBTOOLBOX2 has been replaced by IQM Tools and is now maintained by IntiQuan. You can download IQM Tools from here. IQM Tools has the same functionality as the latest SBPOP Package and adds quite some additional things. It also has been made more robust and better documented. As the SBPOP Package also IQM Tools is distributed as open source and free of charge. Model-based drug development (MBDD) emphasizes the quantitative integration of the relationships among diseases and disease targets, drug characteristics, and individual variability across studies and development phases for rational and scientifically based decision making. Within MBDD, mathematical models are used to integrate available knowledge and complex heterogeneous data to allow for hypothesis testing, design and optimization of learning experiments/studies, and subsequent confirmation or rejection, leading to increased knowledge (REF). Model-based drug development deals with a large model space, consisting of, for example, Systems Biology/pathway, physiologically based PKPD, dose-concentration-response, and mechanism based disease models. Fast turnaround of modeling and simulation activities is crucial in order to influence the decision making process in drug development projects. Such a fast turnaround, however, requires that workflows are efficiently supported by powerful and user-friendly tools. The “SBPOP PACKAGE” has been developed as a toolbox for the widely used general purpose mathematical software MATLAB. It consists of three parts: SBTOOLBOX2, SBPD, and SBPOP. The first two parts are widely used in the area of Systems Biology, implementing functionality for general representation of dynamic models, simulation, analysis, parameter estimation, and high performance simulation. While these parts are ideal for the support of data and information integration in the research and preclinical phases of the drug discovery and development process, the third part (SBPOP) adds seamless functionality for data analysis and exploration, population PK/PD modeling, and clinical trial simulation. An important focus in the development has been on user friendliness, documentation, training material, and extensibility. 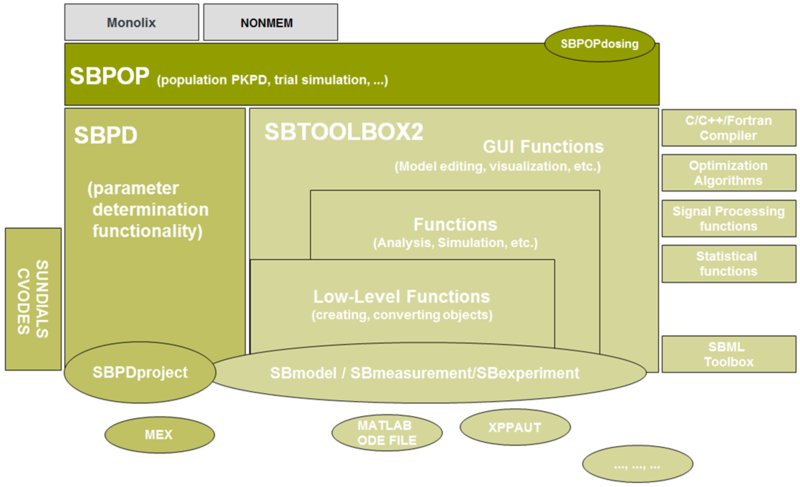 The “SBPOP PACKAGE” is continuously developed further to include additional analyses and workflows of standard modeling approaches. The development is driven by real needs in real drug development projects, with the goal to increase efficiency, allowing for timely feedback of results and insights to the decision making process.